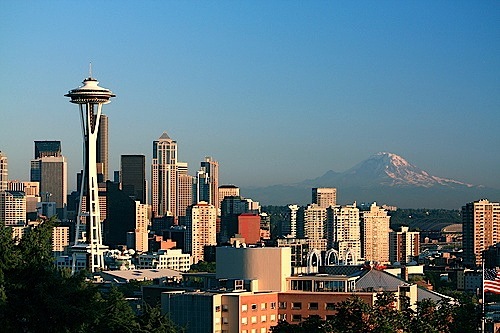 “Seattle is a progressive city where rainwater collection is becoming mainstream – whether it be small residential supplementary systems or large scale commercial systems. All have a positive impact on storm water management and I am proud to be a part of the process. I would like to thank all my customers, past, present, and future for their commitment to helping our region’s environment.”, Ken Blair, president, RainBank Rainwater Collection Systems. June 29, 2014 – Seattle, WA. RainBank Rainwater Collection Systems’ president Ken Blair has been invited to be a guest speaker at the American Rainwater Catchment Systems Association 2014 annual conference in Phoenix, Arizona on November 17th. Ken is honored to be recognized among his peers as a leader in rainwater collection and storm water management. Ken will discuss “urban rainwater case studies”, an in depth look at decentralized water systems for commercial and residential application in the Seattle area. Both potable and non potable systems designed and constructed by RainBank Rainwater Collection Systems will be highlighted, with emphasis on reduction of storm water run off. The time is now for Seattle to be recognized as a leader in Green Storm Water Infrastructure. Protecting our natural environment from the pollutants from storm water run off is essential for our way if life in the Pacific North West. How Do Bolted Rainwater Collection Tanks Hold Water? Want to know how we hold water in rainwater harvesting tanks that are bolted together? RainBank employees hang a 25 mil. PVC liner for an 18,000 gallon tank. 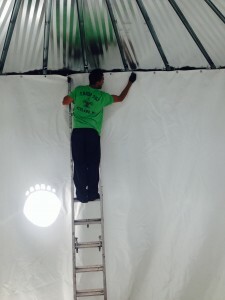 In order to hold water in rainwater collection tanks that are bolted together, first a heavy geo-textile pre-liner is hung against the steel wall panels to eliminate abrasions from the steel. 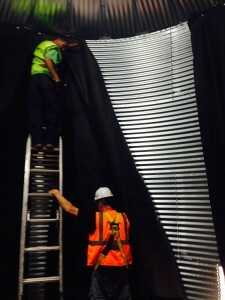 Then the liner is hung from the upper row of horizontal bolts. Plumbing penetrations are made through the cement floor or through the steel walls with flanges. RainBank is honored to be currently building two 18,000 gallon rainwater collection tanks for the Army Corps of Engineers at Joint Base Lewis-McChord, WA. 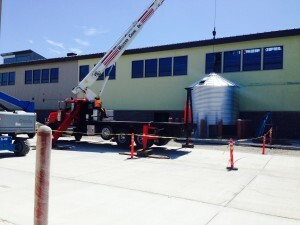 Both tanks will harvest rainwater to be used for for wash down and toilet flushing. RainBank salutes our men and women in uniform.